Books are my happy place. My favourite way to spend my life minutes when I'm not working, sleeping, or hanging out with my favourite humans is to dive into a good book (or audiobook) and lose myself in its pages for a while. I can't believe it's taken me this long to read Meg Wolitzer's work - she is incredible. Her writing is so sharp, and witty, and engaging and I read this book in just a few sittings. The story of Joe and Joan Castleman and their trip to Helsinki for him to win a prestigious literary award, it explores their relationship and the lies and the compromises that have shaped their marriage along the way. It's such an interesting exploration of marriage, ambition, and the sacrifices and compromises we can make over a lifetime together, and Meg Wolitzer writes with such a clear and witty tone and now one of my reading goals for this year is to read as many of her novels as I can. I'm especially excited for the launch of her latest book, The Female Persuasion, this summer. Alexandra Franzen is one of my favourite writers on the internet, so when I had some downtime over my Christmas break I realised it would be the perfect time to dive into the two fiction books she's written. I downloaded them to my Kindle app and devoured them both in just a couple of sittings each. Milk & Honey is a love story about a writer and a pastry chef, and So This Is The End is a story inspired by the question - what would you do if you only had 24 hours left to live? They're both such fun reads, and what I loved the most was seeing a different side to Alexandra's writing and just losing myself for a few hours in the worlds she created in these novels. If you're a fan of her work too I definitely recommend putting these on your to-read list. And another Alexandra Franzen book I read is her latest release, You're Going To Survive, which is a collection of true stories about people who have navigated and overcome rejection, criticism, failure, disappointment and public humiliation. It's such an awesome read for anyone who is pursuing a creative career and is in need of some encouragement along the way - it's a great reminder that we all face failure and disappointments in this journey and that the most important thing is how we survive those moments and continue to keep going instead of giving up. Promise Me, Dad chronicles a year in Joe Biden's personal and professional life and it felt, ultimately, like a love letter to his eldest son, Beau, who died in 2015 from brain cancer. I listened to the audiobook of this and many times I stopped and realised that tears were streaming down my face, and I was so inspired by the courage and grace that Joe Biden has shown in the face of so much loss and grief in his life. He also shares in this book so much about his role and work as Vice President, his relationship with Barack Obama, why he decided not to run for President, and the purpose he has found in his work. It felt like such a personal book - Joe Biden narrates the audiobook so I think that helped - while also sharing lots of interesting stories from his political career and work too. Oh I loved this book so much. Little Fires Everywhere was one of my favourite reads of 2017, so I was super excited to read her earlier novel too. Everything I Never Told You explores the story of a Chinese-American family living in a small town in Ohio in the 70's and how they navigate the death of their oldest child and the years and moments that lead up to her death too. Celeste Ng has such a beautiful way of writing - there were many moments throughout reading this where I had to stop and re-read a sentence because it was such beautiful prose - and this book is such a great exploration of the ways, as a family, we can struggle to really understand and know each other along the way. I really enjoyed this memoir from Anna Kendrick - it made me laugh out loud oh so many times. It's a collection of autobiographical essays sharing her childhood, her journey into the performing arts, her experience of being an Oscar nominated actress and so much more. It's fun and light and I listened to the audiobook of this which Anna narrates herself and it was a really nice way to pass a couple of long car rides and a lazy Sunday afternoon too. If you're a fan of Anna's I think you will love this. So this is the only book on this list that I haven't finished as I ended up giving up halfway through. I have the audiobook of this and I really do enjoy and respect Sarah's work and I think she has some great ideas and a really fun way of expressing them, but I had that moment halfway through this when I just felt like I'd rather use my life minutes to read or listen to something else. I think I'm maybe no longer in the market for self-help books that are this prescriptive, but I do think this could be a good read for someone who really struggles to do things their own way and needs a whole lot of encouragement and a reminder that they have permission to do so and some practical guidance for how they can. I loved this book. I'm lucky enough to call Cait a friend and we've connected over Skype and emails these past few years (and she's coming to the UK later this year which I'm super excited about) and her memoir chronicles a year in her life where she decided to go on a shopping ban, but it's also so much more than that. It's a beautiful story about recovery, and family, and finding out who you really are and understanding why we sometimes make the mistake of thinking that our happiness will come from inside of a shop and not from inside of ourselves and the relationships that truly matter to us. This is the first book of Dani Shapiro's that I've ever read and I now understand why she's such a cherished and celebrated writer. Hourglass is a memoir about marriage and time and explores how a marriage can be shaped and challenged and defined over the years. She shares so much of her own life and marriage, exploring its own challenges and vulnerabilities, and from the first page I felt so drawn into this book and I just couldn't put it down. So this one is a little bit of a cheat as I started it in January and didn't finish it until early February but I wanted to still include it in this round-up. I was so excited to dive into this one - first thing I did on the morning it was released was buy it, download it to my Kindle app, and dive in straight away. Still Me is the third book about Louisa Clark - I don't want to spoil the story in case you haven't read Me Before You or After You yet - but safe to say, like the previous two, this is such a fun and hopeful read. If you're already a fan of Jojo Moyes and this series you'll probably already have read this and loved it as much as I did, and if not I definitely recommend checking it out and seeing if it's a book you might enjoy too. I know one day I'll go back and re-read all three - they're the perfect books for when you want something easy and fun and that may make you cry a little but always leave you feeling hopeful. 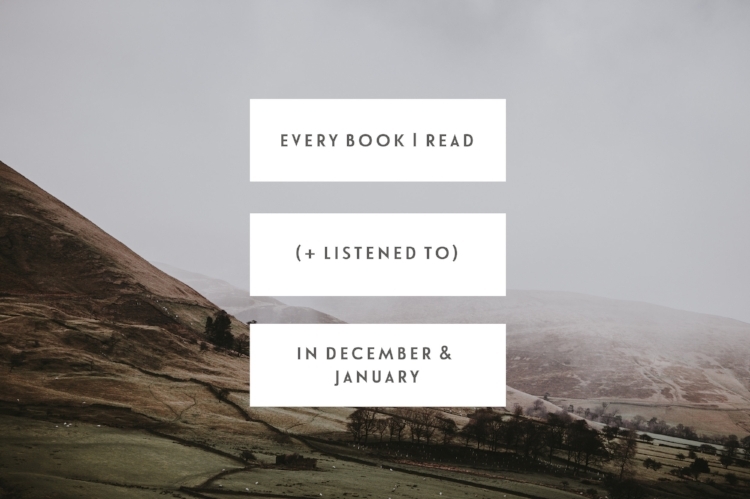 What books did you enjoy reading in December and January?